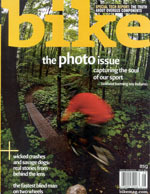 A photo that Ray took on our arctic bike trip is in the August issue of bike magazine. 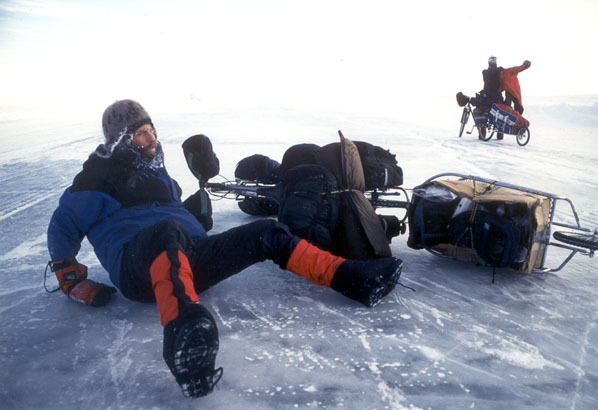 This is the photo issue, so there are a lot of great photos, but of course Ray’s shot of Gary wiping out on the ice road on the MacKenzie River is my favourite. I’m the one in the background showing great concern for my cycling partner as I put on another layer. I think it was the graders that left deep grooves in the ice. Every now and then, we’d catch our wheel in the groove and there was no way to steer out of it. We would wipe out every few kilometres or so. You are currently browsing the Bicycle Forest Blog weblog archives for August, 2005.